S2S Green graphite shafts are available in both woods and irons, in both an A/L combination flex and a new R/S combination flex to now fit a wider range of golfers with smooth to average swing characteristics. S2S Green golfer type – driver swing speeds from 50-70mph to 70-90mph, smoother to average transition force, slower to average tempo, early to midway release. Combination flex design offers more versatility for custom trimming to achieve “in between” flex fitting requirements, and to keep inventory levels lower in the shop. No flex letters are printed on the A/L shafts to allow “vanity” fitting for golfers who need a more flexible shaft but do not want others to know what flex they are using. Regular/Stiff is printed on the R/S combination flex S2S Green shafts. What is the weight of the S2S Green graphite shaft in regular for irons. Thanks. 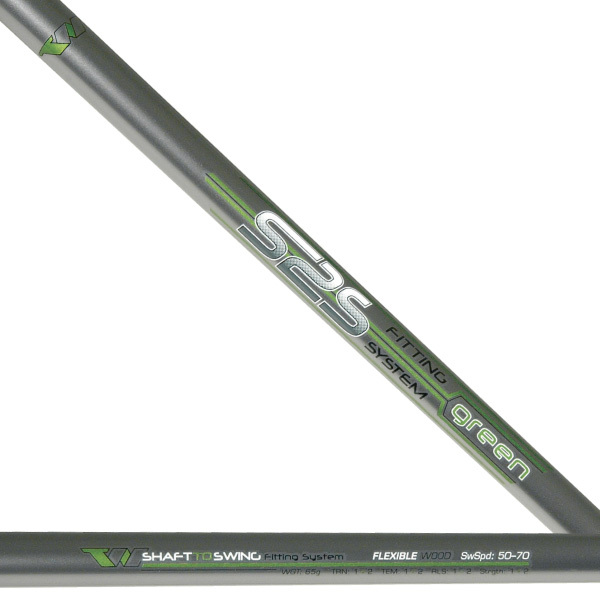 The S2S Green R flex iron shaft weighs 70g in its raw uncut combination R and S flex version. When trimmed and installed it drops down to the low 60s in gram weight. I’ve had my irons for about 5 years. Over those five years, I have changed my swing to get more consistent contact. My swing has slowed down (84 mph w/ driver) and I would say that I have a smooth tempo. My 150 yard iron has gone from a 7 iron to a 5 iron in those five years. Because I love the iron heads, it makes sense to me to go to a fitter to get my irons re-shafted. I recently moved from the Milwaukee, WI area to the Janesville, WI area. Do you have a shaft or shafts that I can suggest to the clubfitter to start with and do you have a fitter that you would recommend? First off, my sincere apology for the delay in responding. The notification feature for posts and comments was not working so we haven’t seen the posts being made here for us to respond. That’s a big Ooops. Sorry about that. First thing I would recommend is to tell the fitter what you are looking for as your main goal – in this case I imagine getting back some distance with the irons. Put yourself in his hands for his recommendations. But I would tell you to think about two main things – 1) a much lighter weight iron shaft such as our S2S Blue at 55 grams. That will lower the total weight of the irons and that can add back a couple of mph of clubhead speed for a little bit of distance. 2) consider our model 771CSI irons because with their 0.830 COR face, you can’t find an iron that will deliver better ball speed for each loft iron. 3) possibly bend the lofts on the 771CSI 1 to 2* lower for each iron to offer a little more distance. That’s a small loft decrease so it won;t mess up the sole angle. 4) Be VERY honest about evaluating what is the lowest iron loft you can comfortably hit high to fly and carry well, as well as with reasonable on center hit consistency. Do NOT trick yourself into using any lower loft irons than you have the confidence you’ll achieve a reasonably high level of shot consistency with. And then at that break off point in the iron set, use hybrids or high loft woods above that point. So in my set, my irons go #6 to wedges. I use a 5 hybrid, then a 4 hybrid, then a 7 wood, then a weak loft #4 wood and then driver. Some people who see me hit shots or see that I can still break 80 laugh at me when they see I do not have an iron lower than a 6 iron. but I am playing SMART golf by playing the percentages of what clubs I know I can hit more consistently and leaving the ones out that I have a little doubt about.